The month started, or perhaps more accurately January finished, with Kettering Lions Club’s charter anniversary. This was a well attended (over 100) event due, at least in part, to the guest speaker being Gail Stuart, daughter of Eric Morcambe. A very entertaining speaker, Gail was also a good dinner companion for Christine. 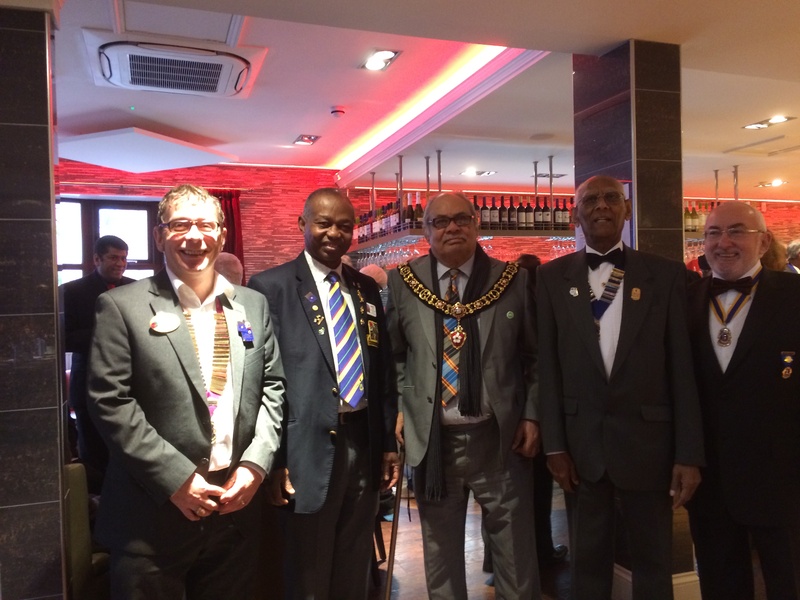 The following Sunday was a lunchtime charter anniversary with Kenilworth Lions Club. This was a different sort of event with only members of the club and their personal guests in attendance whereas Kettering had representatives from a large number of different clubs. Nevertheless another enjoyable occasion and an opportunity to meet another Mayor, Felicity Bunker. I am always impressed with the schedule of most mayors and Felicity was no exception having some 300+ engagements during her year of office. The next two weeks were largely taken up with club visits to Birmingham Handsworth, Sutton Coldfield & Erdington, Rugby Rokeby, Wellesbourne & District, Birmingham Acocks Green, Coventry Phoenix and Droitwich Lions Clubs. All very different clubs and all very busy with service and fund raising events. Mid February saw the third district cabinet meeting of the year and an opportunity for me to present excellence awards to last year’s DG team, Region and zone Chairmen. I was also finally able to present our Dream Achievers gold award to the membership and leadership teams. That same weekend I attended the annual conference of the Lionesses of MD105. Lionesses are really a throw back to the days when Lions would only accept men but a number of Lioness clubs have continued to thrive into more enlightened times. I was at the conference as host governor and was able to attend the business session on the Saturday as well as the previous night’s Race night. On the Saturday Night I had to make my excuses as I was already booked to attend Walsall Lions Club’s 39th Charter Anniversary where entertainment by Lisa-Jayne Smith as Marie Lloyd turned in a to a right old knees up. The following weekend saw me at two more charter anniversaries, Bromsgrove’s 34th on the Saturday night with entertainment from Tipton poet Dave Bartley and Bushby’s 18th for Sunday lunch. At the latter event I was proud to be able to present their President Dullabhbhai with a Melvin Jones Fellowship on behalf of the club. Dullabhbhai is an amazing man. After many years in business and working in the community in this country he finally joined Lions at the age of 76. Five years later he has raised over £40,000 for Lions to fund eye camps and has saved the sight of several thousand people. He has now taken on the role of President at the age of 81. We often complain about the age of Lions, and I’m sure that Dullabhbhai would agree that we need younger members, but he shows that age need not prevent you from providing quality service. February also saw Christine and I take part in two Lions organised quizzes, Zone H’s where we partnered Region Chairman John and President Barbara from Kettering and the district Master Team competition run bu Knowle and Dorridge Lions where we partnered Jonathan and Sara from our club. I am proud to say that we won both events. Coming up in the next part of this catch up will be UN Day with a special presentation for one of my club members.